If blog posts were scratch n sniff, this would be amazing – the scent of lemon verbena is a citrus-packed heady oomph of sherbet lemons and something much more sophisticated and almost floral. It makes you feel better just by smelling it, which is why lemon verbena is a popular choice for people looking for an uplifting and relaxing scent. It’s popular in yoga and meditation classes for just this reason. 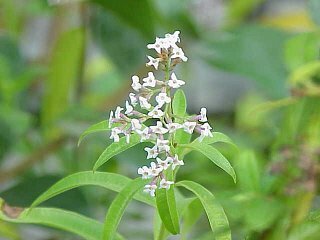 Essential oil of lemon verbena is packed full of skin renewing antioxidants. Our Druid’s Rest soap combines lemon verbena’s benefits with vervain, a herb known for its relaxing and calming properties. Best to grow your lemon verbena in a pot. It will thrive in full sun and sheltered spots in the summer, but keep your plant in the greenhouse over winter as hates cold or frosts. You can take leaves from it throughout summer and autumn, and when the leaves start to fall (it’s deciduous) dry your leaves and wait for fresh ones in spring. Storing the leaves Store it by air drying upside down in a brown paper bag. Then once they are dry enough to snap the stems, strip off the leaves and add to a jar storing in a dark place to keep those essential oils in. Handmade soap: why should I make the switch? Can I grow herbs in September or have I left it too late?